WHO IS MR. L? « Stand-Up for Kids......Learning through Laughter! Home » INFORMATION ON THE SHOW » WHO IS MR. L? Michael is a “stage natural” (Ft. Lauderdale News) and evidence of this was seen very early on when he entertained scores of women at his mom’s Tupperware parties. Michael’s extraordinary ability to bring laughter to people everywhere eventually led him to an open mic night a week after he graduated from the University of Florida. 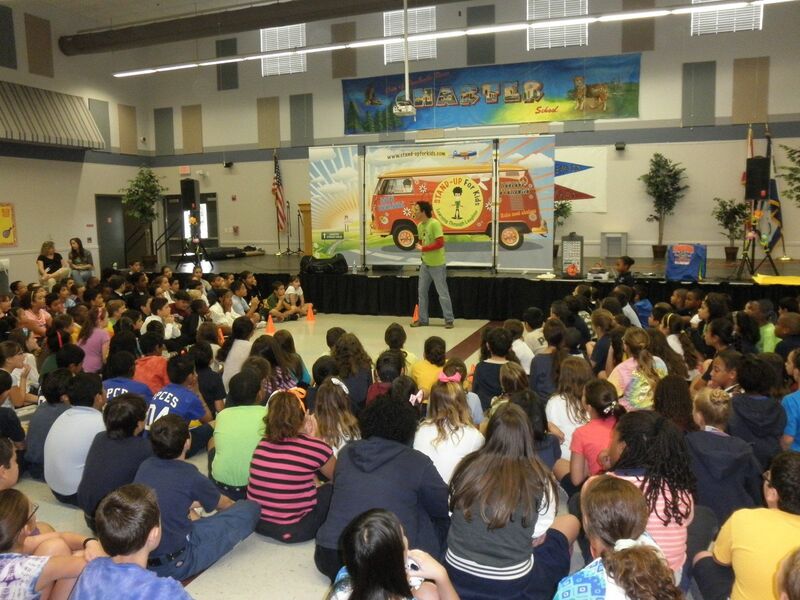 While teaching in the public elementary school system by day, he was honing his stand up skills at local South Florida clubs with the likes of “Carrot Top” and “Larry the Cable Guy” whom Michael has shared the stage with on many occasions. Since the late 80’s, Michael has compiled an impressive comedy resume that includes performances on the world-famous Las Vegas “Strip”, numerous appearances at colleges and universities, comedy clubs and as an opening act for the legendary Motown artist Smokey Robinson. In 1995, Michael teamed up with fellow comic and longtime personal friend, Dave Clark, and together the two of them carved out a Las Vegas style comedy show built around their highly successful and vastly different stand-up acts. Thus, “Pure Insanity” was born! During that time, Michael was also performing stand-up comedy shows for kids. Michael had always seen the need for the public school system to address character education. Drawing from his days as an elementary educator, Michael knew that the best approach for him was to teach character through laughter. So, he decided to utilize his experience as an educator and his charismatic and electrifying performance skills to create “Stand Up for Kids”. Michael’s unique ability to perform age-appropriate stand up comedy coupled with a powerful and moving message has inspired thousands of children, educators and parents throughout the country. His amazingly energetic and captivating performances cause hysteria amongst the students while they learn what it means to be a “STAR”. Michael resides in Las Vegas and performs “Stand Up for Kids” and his (adult comedy) show, “Pure Insanity” all over the country. He enjoys traveling, hiking, playing sports and performing live.